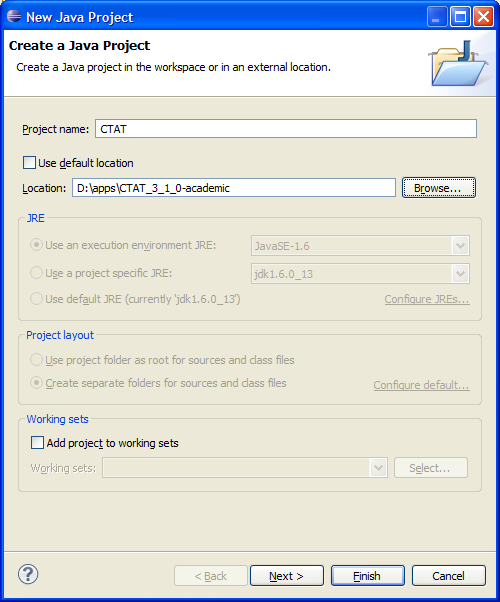 As of CTAT 3.1, we recommend using Eclipse WindowBuilder to create Java student interfaces. With previous versions of CTAT, we recommended NetBeans. You do not need to follow these instructions if you are using Flash for creating student interfaces. If you are familiar with Eclipse and have it installed already, you can install WindowBuilder as an Eclipse plugin. In Eclipse, select Preferences from the Window menu. Under "Default code generation settings", set the "Variable generation" to "Field" by clicking on the "Field" tab. 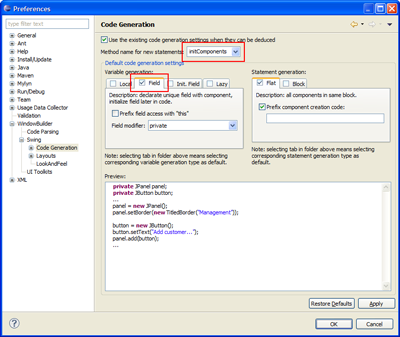 For compatibility with NetBeans, select "initComponents" from the "Method name for new statements" dropdown. Important: On the Libraries tab, select all entries beginning with CTAT/deploy and click Remove. Note: Failure to do this step will result in an error when you try to run your tutor: "(java.lang.SecurityException: class someClassName's signer information does not match signer information of other classes in the same package". Expand the new project in the Package Explorer, right-click on the "Projects" folder in Navigation panel, and select New > Other... from the menu. 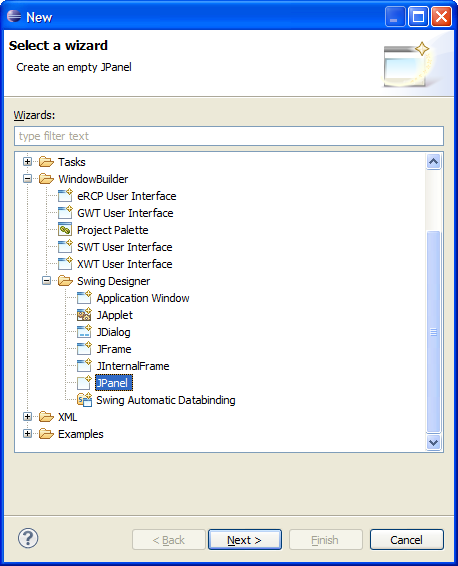 Select WindowBuilder > Swing Designer > JPanel in the dialog, and click the Next button. In the "New JPanel" dialog enter a folder name for your tutor in the Package field, e.g., myNewTutor. 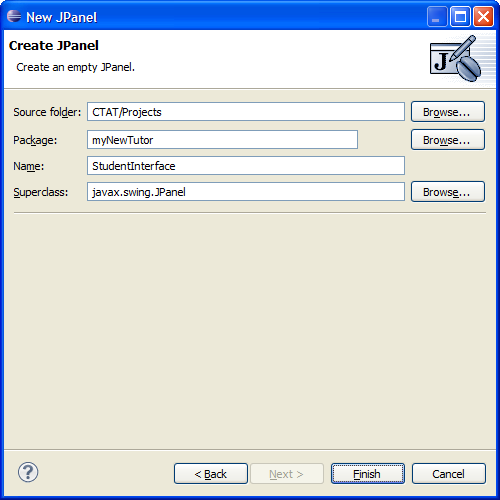 In the "New JPanel" dialog enter a file name for your tutor in the Name field, e.g., StudentInterface. Click the "Finish" button. 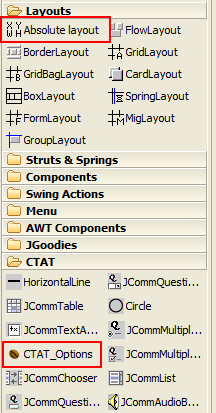 StudentInterface.java should open with a "Source" and "Design" tab at the bottom. In the "Palette" panel, right-click on any of the displayed folders (e.g., System) and select "Import Jar..." from the menu. 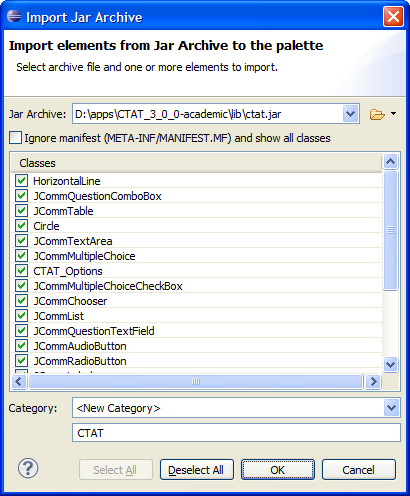 Select ctat.jar as the Jar Archive, then click the "Select All" button. Select <New Category> and enter a name for the CTAT components, e.g., "CTAT". 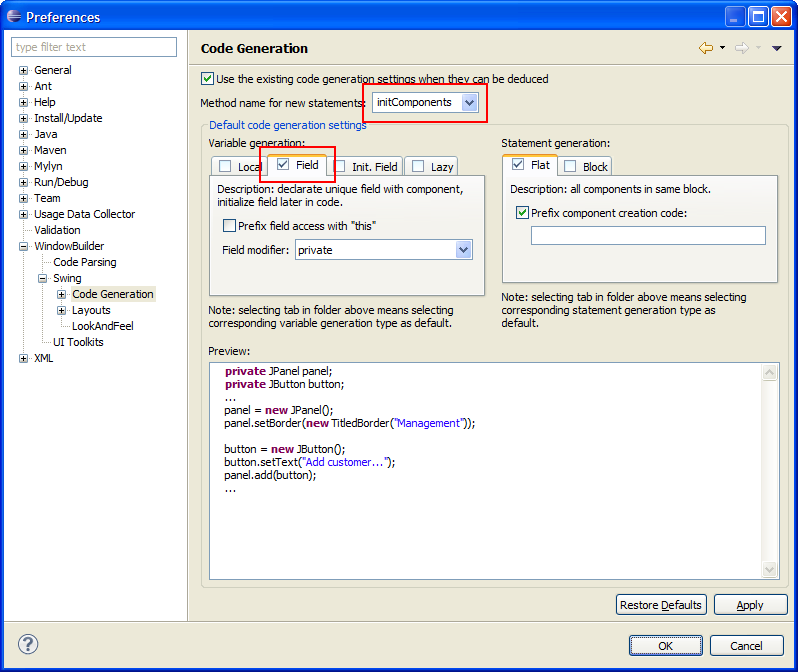 Create a new JPanel class following steps 4-9 above. Click on "AbsoluteLayout" and drop it in the JPanel. Click on "CTAT_Options" and drop it in the JPanel. Design a simple interface by adding CTAT components to your JPanel in Design view. Note: Make sure you set the CommName property for each widget you add to your interface. 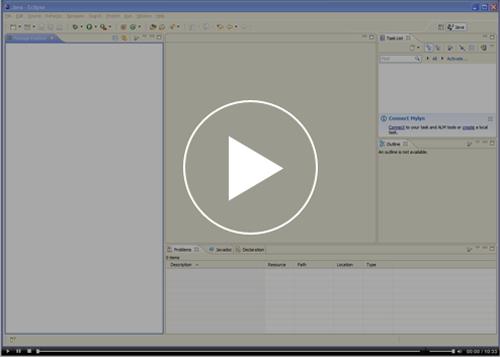 The CommName should be set to the widget's variable name, which is displayed at the top of the Properties panel after selecting a widget. 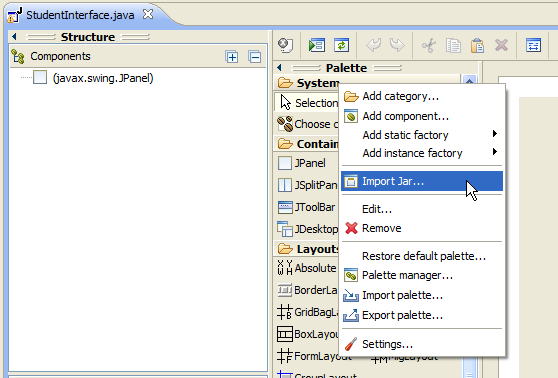 In the Navigation panel, right-click on the file name, and select Run As... -> Java Application. Verify that the student interface and CTAT opened.